Born in an ox’s stall. I’m an angel above you all. And o’er the water crossed He. Sung by Mrs. Hands of Snowshill, Gloucestershire. Mrs. Hands could only remember the words of the final stanza. The lines in the text are from Mr. George Gibbs of Evesham, Worcestershire, who communicated them to the "Notes and Queries" column of The Evesham Journal, edited by Mr. E. A. B. Barnard (see Notes and Queries concerning Evesham and the Four Shires, 1911, Vol. I, p. 217). Mr. Gibbs, a cobbler by trade, told me that he learned the verses from a little girl who used, from time to time, to bring him her shoes to be mended, and who, in return for the service rendered, taught him the carol. I have collected two other variants, from Buckland (Gloucestershire) and Shipston-on-Stour (Worcestershire). Neither singers could give me more than the words of the last stanza, the Worcestershire singer telling me that the stanza was sung as a refrain after every verse of the song. Mr. Gibb's words are printed without alteration. The origin of the legend, upon which this curious carol is based, has attracted a great deal of attention from ballad students during the last few years, and has been exhaustively debated in the pages of The Folk-Song Society's Journal (II, pp. 205, 300-4; IV, pp. 29-47) where six traditional tunes are printed, together with several versions of the text. The Bitter Withy has obviously been affected by the ballad Little Sir Hugh of Lincoln. The two have certain points in common. Both open with the same incident — a child asking his mother's permission to go out and play at ball — and both lead up to a tragedy. The opening stanzas of the two songs are, in some versions, nearly identical. This coincidence accounts, no doubt, for the intrusion into the text of the Bitter Withy of the line "Then up Lincull and down Lincull," and of a similar line "It was upling scorn and downling scorn" in a version quoted by Mr. Frank Sidgwick (More Ancient Carols, Stratford-on-Avon, 1906, p. 7). It is clear that both lines are merely corruptions of "Up Lincoln and down Lincoln" (cf. "American Corn" for "Merry Lincoln" in Folk-Songs from Somerset, No. 68). 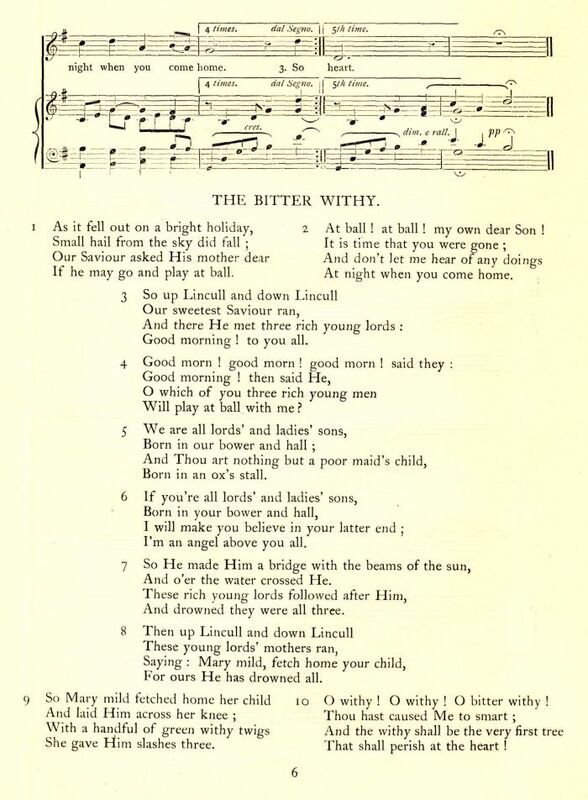 The Holy Well has been a popular ballad with folk-singers; for Mr. Harris Cowper quotes a version from a chap-book printed at Birmingham, circa 1843; and I have in my possession two Birmingham broadsides by Russell, and Bloomer, from the former of which the above stanzas have been copied. Although there are several incidents in the Apocryphal Gospels of the Infancy which bear upon the story of The Bitter Withy, not one of them is identical with it. In the Arabic Gospel of the Infancy, for instance, the Lord Jesus, going out into the streets to play, follows some boys who, in order to evade Him, hide themselves in a vault and are changed by Him into kids. In the Syriac Gospel of the Boyhood Jesus, when five years old, plays at a ford with streams of water, collecting them into a pool. One of His companions took a stick from a willow tree and destroyed the pool; whereupon Jesus said: "Without root shall thy shoot be, and thy fruits shall dry up like a bough of the wood which is broken by the wind, and is no more. And the boy immediately withered away" (Cowper's Apocryphal Gospels, p. 449). In the same Gospel a boy, who was running, struck Jesus with his shoulder. 'Jesus saith unto him: Thou shalt not go thy way. And immediately he fell down and died." Again, Jesus was playing on the housetop when one of His companions, Zeno, accidentally fell down and was killed. Jesus, accused by the boy's kindred of casting the boy down, said to Zeno: "Did I cast thee down?" Whereat Zeno leaped up and said: "No, my Lord." Now the main thesis of all these stories is very similar to that of The Bitter Withy; the Infant Christ goes out to play, someone offends Him and in consequence suffers death, or severe punishment, brought about by supernatural means. But this, it will be noted, is in marked contrast to the story of The Holy Well, in which Jesus refuses to punish those who have slighted Him, even when incited to do so by His Mother. From this we may, I think, conclude that the Holy Well is a comparatively modern recension of The Bitter Withy, modified so that it shall the better accord with a truer conception of the character of Jesus. Sharp also collected a version of "The Bitter Withy" as sung by Thomas Taylor (67) at Ross Workhouse, Herefordshire, 1 September 1912 (eight verses), plus an additional tune sung by John Hands (65) at Snowshill, Gloucestershire, 9 April 1909 (sung to words taken from the Evesham Journal). See Maud Karpeles, ed., Cecil Sharp's Collection of English Folk Songs, Vol. 2, (London: Oxford University Press, 1974), No. 361, pp. 485-487. 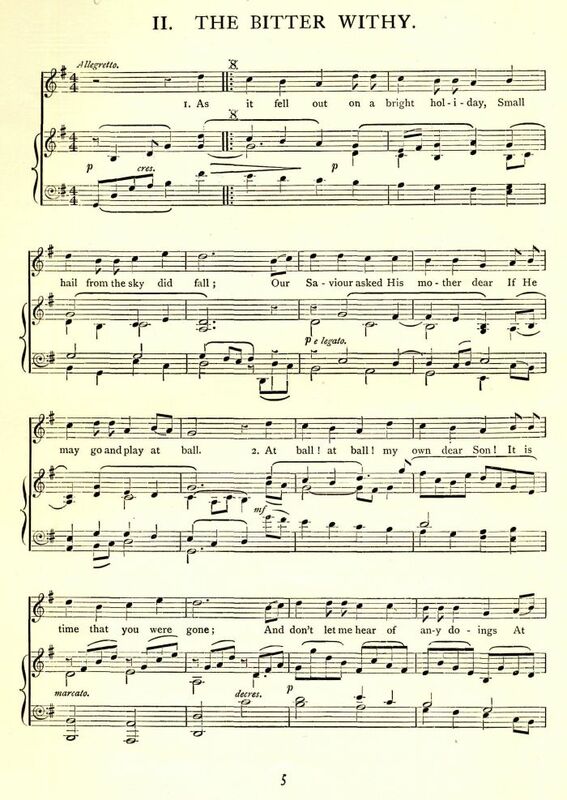 Another version of The Bitter Withy is in Roy Palmer, ed., Folk Songs Collected by Ralph Vaughan Williams (London: J. M. Dent & Sons, 1983), No. 44, pp. 70-71, ten verses). Due to copyright, neither version can be reproduced on this site.